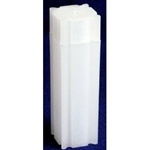 Our Coin Tube inventory consists of the popular round style tubes, and the square coin tubes. Our round tubes will hold a full roll of coins without the paper wrapper and are made by Whitman. Our Square coin tubes will hold a full roll of coins with the paper wrapper and are made by Coin Safe and Numis. You can purchase the tubes individually or by the box of one hundred.